Endodontics is the study of the dental pulp and supporting tissues and any disease or injury to it usually requires specific treatment in order to save the tooth. As well as root canal treatment, which is the most common, other options can include extraction and surgery. Dentists who undertake endodontic treatment will have had significant additional training in this area, and although general dentists can, and do, carry out root canal treatments, they will often refer more complicated cases. 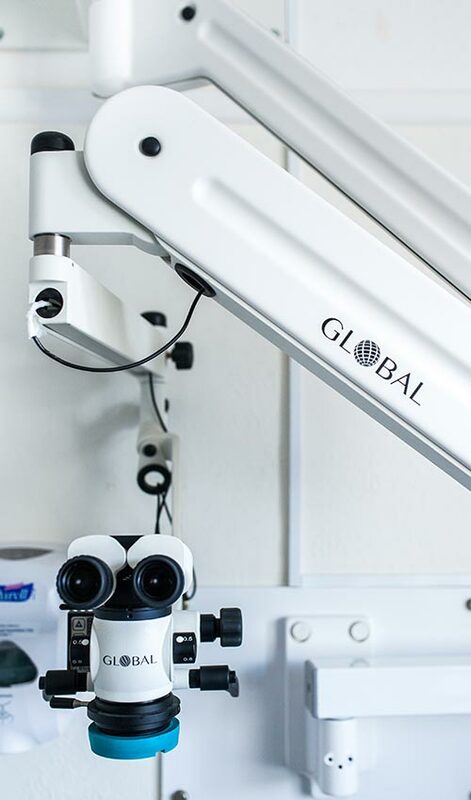 In root canal treatment the teeth are treated by isolating them under a protective barrier (rubber dam) and enhanced optics and magnification with a microscope are employed. The procedure normally takes 1-2 visits with each lasting about an hour. The best option for most patients is to retain their natural teeth rather than have a replacement, and the long-term success of root canal treatment can equal or surpass implants in some cases. It is also often more desirable to save the tooth than have it removed and replaced with a dental implant. In a root canal, the diseased pulp of the tooth is removed and replaced with a special material called gutta percha. You may be suffering from tooth pain related to dental decay or your tooth may be fractured. In either case the pulp of the tooth has been exposed to bacteria, which over time has led to infection. In this case the infected root needs to be removed. What will happen at my appointments and will it hurt? The procedure normally takes 1-2 visits with each lasting about an hour. In root canal treatment we isolate the tooth under a protective barrier (rubber dam) and use a microscope to get a good look at it. During the first appointment the pulp is usually removed and any abscesses are drained, giving you immediate relief from pain. The tooth is then sealed with a temporary filling to protect it from contamination. At the second visit, we replace the root with the filler. Then a crown is usually placed over the tooth to seal and protect it from recontamination and future damage. With adequate anaesthesia, root canal treatment is usually painless and patients often fall asleep during the procedure. The best outcome for most patients is to retain their natural tooth rather than have it removed and replaced with a dental implant, which is the goal of root canal treatment. The long-term success of a root canal can equal or surpass implants in many cases. Who can perform root canals? Dentists who undertake endodontic treatment will have had significant additional training in this area and, although general dentists can, and do, carry out root canal treatments, they will often refer more complicated cases. 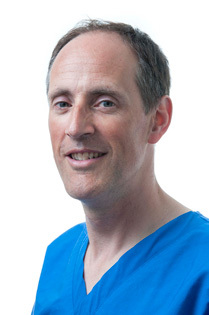 John Miller has years of experience in endodontics, works with Oxfordshire Primary Care Trust as a dentist with a special interest in endodontics, and with the endodontics team at King’s College Hospital. He welcomes referrals from other practices for patients requiring endodontic treatments. We make every effort to provide a welcoming and calm environment in which to treat you and we'll always talk to you about the best treatment options for a long-term solution. If your own dentist refers you to us we will fit a temporary restoration until you complete the restorative part of the treatment at your own practice. We will send a letter to your regular dentist explaining the treatment that has been carried out and what has been achieved. Worried about root canal treatment? Don’t be. John Miller is has years of experience in endodontics and will diagnose your individual problem and recommend the most suitable treatment. I first contacted Dr Miller’s practice because I was in pain with my tooth. Over a few months, one of my teeth had become increasingly sensitive. My previous dentist had tried unsuccessfully to treat it and as a retired dentist myself, I suspected that the problem was a serious one which would require root canal work. After some research into local dentists with postgraduate qualifications in this speciality, I found Dr Miller. My initial impressions of the practice were very positive. It was bright and clean and the friendly welcome given by the receptionist was designed to put me at my ease. Dr Miller listened carefully to my story and after an examination, concluded that I did indeed need a root filling. As by then I was in considerable pain, he arranged to see me the next day to start the treatment. Dr Miller is very expert, as is his dental nurse, and the treatment was pain-free, efficient and effective. In order to prevent any anxiety I might have, he explained every step of the procedure. His prompt intervention not only removed the pain, but more importantly also saved my tooth. I am going to continue as his patient, as is my husband. I thoroughly recommend his practice to anyone looking for a new dentist.